You don't hate beer; you just haven't met the right one. If you've tried beer in the past and didn't enjoy it, that doesn't necessarily mean you're not a beer person. You might just need to find the right beer that works for your particular palate. Beer is not like wine, where all you're getting is flavor variations on multiple varieties of grape. Ales and lagers possess a wide range of flavors that can appeal to any adult drinker. I found a couple locally made examples of lighter beer styles that show off just some of those differences to help transform the reluctant beer sipper into an enthusiast. Fisher Triplet: The guys over at Fisher Brewing Co. aren't big on the term "session IPA," so base-style pale ale is all you'll see in the way of hoppy ales. This new pale ale is a golden-amber color, with some nice orange highlights when it's held to the light. Like many of their beers, this one is unfiltered; it's not hazy by any means, but it has a natural old-school look. There's a good amount of white and billowy froth up top that leaves a lot of lacing to the bottom of the glass. The aroma is fantastic. It's not all citrus and grapefruit; there are notes of pine, along with an aromatic floral bouquet. The taste starts with delightful citrus, but not just grapefruit. It's more of a balanced citrus fruit salad. The malt complements the flavors from the hops with a subtle backbone suggesting graham crackers and cereal. The end is unbalanced (as it should be) with a good dose of Citra, Mosaic and Galaxy hops. Overall: it's a very refreshing, easy-to-drink 4 percent American pale ale. The quality malt is in perfect proportion to the aggressive hop profile. The mouthfeel is substantial, which makes it a winner in this hot weather. 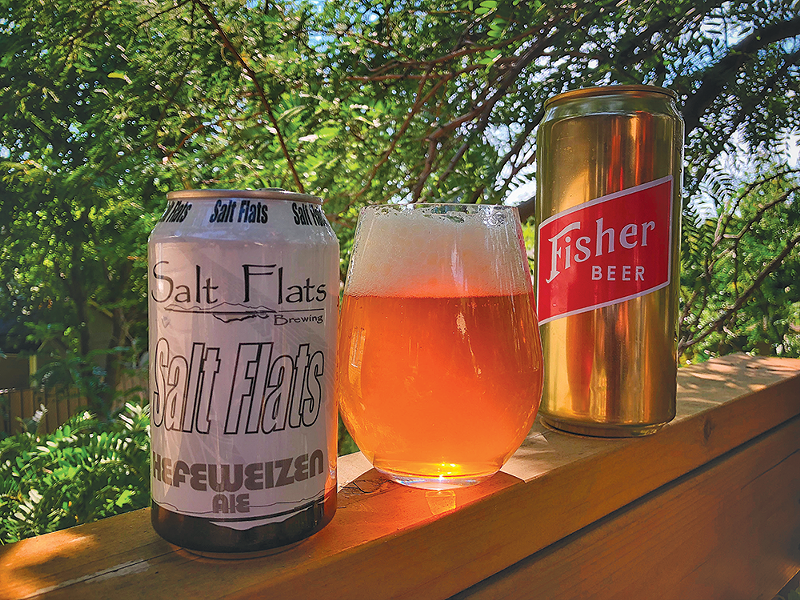 Salt Flats Hefeweizen: This is a good example of a German-style wheat ale. The "hefe" prefix means "with yeast," and this beer lets that yeast shine. Pouring from a can produces a white, foamy two fingers of head that dissipates quickly, leaving thin head lacing. Carbonation is moderate in a cloudy gold body—looks quite appealing so far. There's a moderate aroma of grainy wheat (no surprise) with a light whiff of yeast and a hint of banana and lemon peel, providing a clean, gentle aroma overall. The taste takes some of its cues from the nose; wheat dominates with toasted bread and crackers and a small dose of banana-ish yeast esters. Some bubblegum sneaks in with lemon-like hops and a clean but assertive floral finish. There's a light-to-medium body with a smooth texture that hides any hint of alcohol. Overall: This is a good 4 percent session beer, especially for a hot day. I liked the initial blast of banana and gum followed by the wheat breadiness that carries through half way and stays. It provides good bang for the buck and is easy to drink. I'd definitely buy it again—perhaps another six-pack come Oktoberfest time. Fortunately, you can learn about beers like these while having fun trying a rainbow of different styles along the way. Because demand is so high, the Fisher Triplet (like all of Fisher's beer, for that matter) is only available at their Granary Neighborhood Brewery (320 W. 800 South). The Salt Flats hefeweizen is another story. It's available at most grocery and convenience stores along the Wasatch Front and Back. As always, cheers!